On September 26th, FracTracker staff and board member, Brian Segee, traveled to Doddridge County, West Virginia for an eye-popping tour. 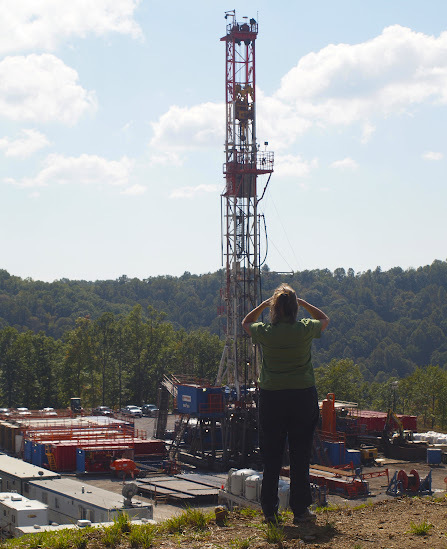 This endeavor was led by Diane Pitcock of West Virginia Host Farms and local activists who are deeply concerned about the fate of their region – an area overwhelmed by shale gas development. Approaching West Union on route 50, a giant flare roars above the roadway and about every fourth vehicle, mostly pickups, tankers, and dump trucks, suggest association with the shale gas industry. At the café in town, vehicles baring EQT logos fill the lot. Nearby, Middle Island Creek flows thick and brown despite an absence of rain for the past five days. Diane says it’s frequently muddy from the constant pipeline construction upstream. The first stop is a Mark West complex with a cryogenic plant burning off excess hydrocarbons, a yard for loading CNG on tanker trucks, one well pad, and another in the works (see photo right). To build the latter, a hillside is being disemboweled. The heavy equipment and a train of idling trucks release diesel emissions. A stream once coursed through the field in the foreground, but the previous landowner had filled and relocated it without a permit. Watching and photographing from the adjoining rail trail, irony rules. The trail sign is topped by a company-placed “No Trespassing” sign. From the discussion and observations, it’s clear that the environment is being devalued and degraded in Doddridge County. The tour continues on to a water withdrawal site. According to the permit numbers plastered beside the conduit, the site hosts approximately 50 unconventional gas wells – each requiring millions of gallons of water to crack the shale and hasten the flow of gas. Next, we traverse gravelly back roads widened by the industry. The roadway expansion often requires the purchase of right-of-way from landowners. Our guides tell us that if a landowner says no, sometimes they are told “if you don’t sell, we’ll take it by eminent domain.” The threat is hollow if not deceitful, since in such circumstances the industry has no right to exercise eminent domain. The industry does have the right to access mineral rights they may own, however, even if they don’t own the property on the surface. In West Virginia, these “split estate” situations are as common as country music, only they project a much more somber note to the landowner, especially when the gas company comes knocking. A freshly cut and clearcut road travels onward and upward across a half mile or more of former forest where a nice lady owns the land but not the natural gas being accessed more than a mile below. Piles of logs line the roadside, a reminder of what was. The road ends at a fenced impoundment holding thousands of gallons of impaired water. An odor, akin to antifreeze, hangs in the dry, dusty air. The lady tells the group about the wildlife she has seen, including the songbirds that rest on the high fence and likely drink from the poisonous reservoir. Downhill lies an expansive well pad, big enough for a football game if there wasn’t the metallurgical din and sprawl of a towering drill rig and the pipes and machinery that accompany it. The landowner’s presence enables our group to enter the working well pad where workers, sleeping off a long shift, emerge from a trailer. While over 30 of her roughly 80 acres are affected by drilling-related activities, only a payment for timber is in negotiation. Meanwhile, she pays the taxes on the land – a parcel that will never quite be the same. Tom Bond, a local and well-informed activist, wistfully comments, “This is just the beginning. Eventually there will be well pads everywhere.” He may be right. A golden afternoon closes crossing steel plates over an open trench and green pipeline. The corridor is an undulating, exposed ribbon of ground spanning ridge to ridge in each direction. There are many more just like it snaking across the hills and hamlets of West Virginia from one compressor station to another. From witnessing the industry’s heavy footprint to the stories we hear of problems emerging in home water wells, somehow a happy John Denver tune now seems melancholy.